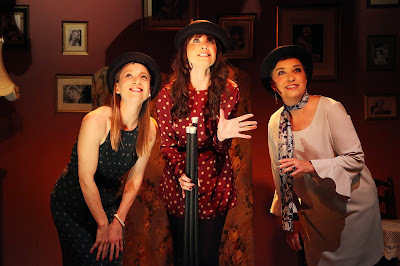 Emma Barton, Ria Jones and Sarah-Louise Young are magnificent throughout, working their way through a set list that was originally put together for a Broadway revue back in the 1980’s. The compilation is rarely seen over here and credit to producers Katy Lipson and Guy James for having the ingenuity to have mounted it so successfully. With perhaps the exception of Milk and Honey, the numbers are all familiar to musical theatre lovers and the combination of gloriously powerful belts intermingled with moments of the purest poignancy make for an evening that would be an emotional rollercoaster were it not all so ridiculously enjoyable. All of Herman’s big shows get a look in, with Barton’s Mabel in Wherever He Ain’t channelling an exquisite vocal presence that also suggests just a hint of Albert Square! From the same show, Young and Jones give a gorgeous and perfectly weighted nuance to I Won’t Send Roses. Herman’s humour sparkles, never wittier than in a song he wrote for the revue, Take It All Off, that wonderfully spoofs burlesque stripping. Again there is fabulous work from Young with Jones being disarmingly (and hilariously) self-deprecating as a stripper whose best years are behind her. There are nods to Hello Dolly throughout, with the show ending on a powerful tribute to all that La Cage Aux Folles stood for. Grins along with lumps-in-throats all round. Kate Golledge directs assuredly, with an entertaining eye for detail. Matthew Cole choreographs cleverly too given the venue's intimacy and that Tap Your Troubles Away evolved into all three women tap-dancing, accompanied by pianist and MD Edward Court and his reed and mandolin playing partner Sophie Byrne on their feet too, (both fabulous musicians to boot) only added to the wondrous sparkle of the occasion. My one regret was not having discovered this gem of a show sooner so I could have had the opportunity to have returned to see it again. Jerry’s Girls is only playing until May 31st. Barely lasting two hours, it offers West End entertainment at a fraction of a typical West End price. If you love what Broadway, Streisand, Merman & co were/are all about, then you’ll come out grinning. Go see this show!